As of right now, 11am PDT, our friendly neighborhood HasbroToyShop website has all 3 of the SDCC 2015 exclusive sets available at their convention prices. These pieces may or may not last long, so if you want ’em, now is your last chance to get them directly. Here’s an official look at all the stuff Hasbro revealed today at San Diego Comic Con during the Hasbro Transformers panel. 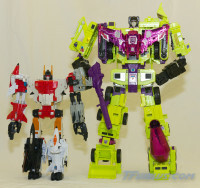 Combiner Wars Victorion (Updated), G2 Superion, G2 Menasor (Updated), and Voyager-class Scattorshot. Robots in Disguise – Clash of the Transformers TRU-exclusives. Platinum Series Blaster & Perceptor set, Platinum Series Trypticon, and Platinum Series Seeker Squadron. Masterpiece Bluestreak, and Masterpiece Starscream. Just received news from friend of the site Bikerscout at the Hasbro Transformers panel that Hasbro will be doing not just a Combiner Wars G2 Superion box set, but also a G2 Menasor box set! 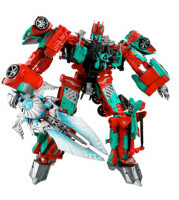 All 3 box sets – Victorion, G2 Superion, and G2 Menasor – will have a collector card and poster. 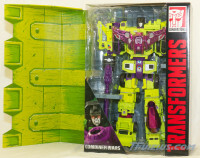 Long-time fans will remember that the original G2 Menasor was never actually released, only photos have been seen, so this is a great get. Update: now we’re hearing that Perceptor and Blaster are next up to get the Platinum Edition treatment and are exclusive to Target, possibly as a set. Even further, Machinima is partnering with Hasbro for a Transformers Combiner Wars animated project. CW will be getting Scattorshot as a remold of Silverbolt, but combined form will be Betatron and appears there won’t be other Technobots coming with him. San Diego Comic Con starts July 8th, and Hasbro is bringing a trio of great exclusives to the convention via their HasbroToyShop booth, as well as being made available in select quantities from the HasbroToyShop.com website after the convention. Here’s Hasbro’s official details and images for Devastator, the Combiner Hunters, and the KRE-O Class of ’85 set.